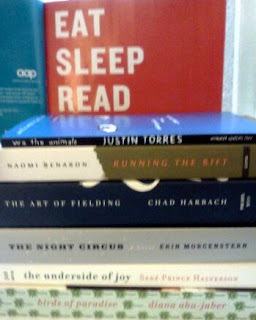 These are the books the editors presented, Monday afternoon, for the Adult Editors Buzz. They were so very passionate about their books. I've already read "We The Animals", it was great. I'm waiting for my shipment to arrive to read some of the others. I'm really excited about The Night Circus and The Art of Fielding. At the Young Adult Editors Buzz, on Tuesday afternoon, four great books were presented. Only Little Brown gave out an ARC and I'm looking forward to reading it. Believe me, they all sounded good. BEA Middle Grade Editors Buzz was on Wednesday afternoon. It was really insightful and passionate; it's so wonderful to hear the editors speak. THE ASHTOWN BURIALS #1: THE DRAGONS TOOTH by N.D. Wilson, Random House Children’s Books – Jim Thomas, Editorial Dir. In total, I shipped 100 pounds of books home. I'm just waiting for UPS, now, so I can sort them out.